Alisha Bhimani kept trying to ignore the voice inside her head — the one that urged her to pursue a career that focused on people instead of lab instruments, on working with the public instead of behind the scenes. But then she took her first trip abroad, and that all changed. A volunteer with Emory’s Medical Global Brigades, she traveled in 2014 to Honduras. "The situations I encountered in one week in Honduras were unlike any I had ever had to confront in a classroom, textbook or laboratory," she says. She was struck by the kindness of the health care providers there to the families and children in their care, and how happy the patients and their families seemed, despite residing in one of the Western hemisphere’s poorest nations. Bhimani decided that she too wanted to be in a profession where she worked with patients and their families directly. Nursing was a distinct possibility. "It’s the one profession where you’re always there throughout the patient’s travails," she explains. "You’re the one who’s going to be in their room at midnight, when they’re upset and need comforting." Yet she wasn’t quite ready to make the commitment to, what was for her, a radical change to her life plan. "I always knew that I had a passion to help and take care of people," Bhimani says. But with a childhood that left her shy and introverted, she felt inadequate compared to her peers, who seemed to have their "lives put together," with a sense of self-esteem and belonging she lacked. Born in Hyderabad, India, to parents who divorced when she was very young, Bhimani moved with her mother to the United States as a toddler. She was a bookish child who spent a great deal of time in the library — a safe place to go after school, while her mother worked. "My mom worked two jobs, but strived to give me a nurturing childhood and passed along to me strong notions about ethics and education, always encouraging me to grow and learn new ideas about the world around me," says Bhimani. At Emory's Oxford College, which she attended with financial assistance from the Emory Advantage program, Bhimani began her academic career in the sciences, also working as a research assistant there. After graduating from Oxford, she moved back home while continuing her studies on Emory's Atlanta campus. She also volunteered and worked full time during the summer, once teaching adult learners basic math and sciences classes in order to earn their GEDs. All 179 of her students passed the exam. "It was just great to see the transformation in these people, who were once scared to speak English but now are in jobs as Montessori teachers or in hospitals communicating in English all the time," she says. She also volunteered at Children’s Healthcare of Atlanta and at Camp Kesem, for children whose parents have cancer. There, she found herself emerging from her shell — leading campers in silly songs and activities but also becoming a mentor and role model — and gaining a healthy dose of self-confidence in the process. Bhimani, whose mother struggled with rheumatoid arthritis, was acutely aware of the toll a parent’s illness can take on children. Bhimani applied to Emory's Nell Hodgson Woodruff School of Nursing on the last possible day and told her mom of her plans at the very last minute. For all the agonizing that went on before, she hasn’t looked back. She is a BUNDLE scholar, a program that trains nursing leaders from underrepresented populations. She has loved her practicums — she’s currently in cardiac ICU rotation at Emory Midtown — and has learned much from the patients in her care. "In the ICU, what I like is that it’s so critically important that you as a nurse are noticing these small things involving your patients and making decisions as to what to do next, because doctors are not always there," she says. Bhimani’s background as a non-native English speaker makes her acutely aware of the disparities in health care, especially around issues of language. It’s not just linguistic barriers that concern her, but the jargon of health care, which patients often find difficult to understand in any language. "The nurse is the one patients will ask questions when they don’t understand," she says. "That’s what they need, not the medical jargon that’s been thrown at them." Bhimani received the Davidson Medicine and Compassion scholarship to take part in the interdisciplinary Italian Studies and Medical Humanities study abroad program last summer. Students travel through Italy examining the country’s history, art, literature, social institutions and daily life through the prism of its longstanding ideals of civic and religious compassion and charity toward others. "I learned that compassion is the light in the dark night. It is an integral pillar in the improvement of a patient’s condition, because it is the kindness of a health care provider that gives the patient the hope to get to another plane," she says. Her experiences abroad have strengthened Bhimani’s resolve to become a patient-centered health care provider after her graduation this year. "I witnessed the impact of real compassion, problem solving and perseverance," she says. 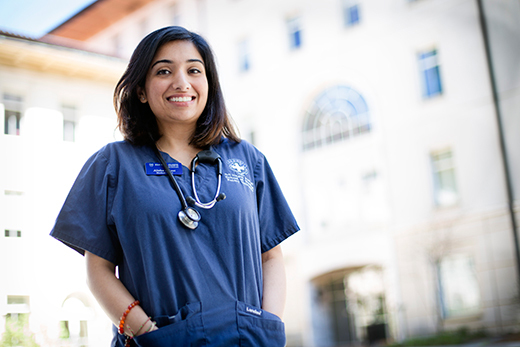 "I just want to continue to serve those underserved populations around me with the knowledge I have gained in nursing and public health at Emory."